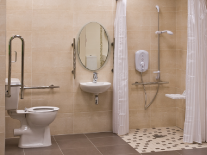 If you have a disability, Bathroom Adaptations can help you to apply for a grant to adapt your home to your changing circumstances. 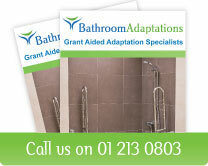 This grant covers bathroom conversions, stair lifts, ramps and a variety of other disability related products. Easy Step by Step Guide on how to apply for a Disability Grant. Contact your local housing authority e.g. 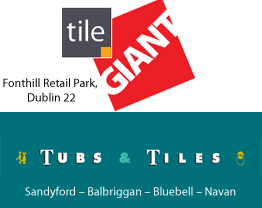 : Dublin City Council, Fingal County Council, South Dublin Co. Co., Dun Laoghaire Rathdown… and ask them to send you an application form for the disabled person’s grant. Read through the form and complete the necessary sections. Your doctor or an Occupational Therapist will need to provide a report and / or fill in and sign a section of the form. You will also need to provide details of your current income level. You then return your completed application form to your local housing authority. When your local authority receives your application form, they will contact you to arrange an appointment for an inspector to call to your home. The inspector will request that you arrange to have a survey(s) carried out by bathroom adaptation / stair lift specialists. You will be required to obtain and submit two quotations completed by two different companies. With over 20 years experience in the area of disability, Caroline and our project manager Larry will be happy to talk to you or visit your house at any time that suits you. After submitting the relevant information to the Authority, you should expect to receive confirmation regarding your grant approval within a period of 4 to 6 weeks. If an application is successful, you will be sent an approval letter stating the amount you will receive towards the cost of the work you need to have carried out. Although the Authorities decide the amount of the grant you receive, you have the discretion to decide which company you want to carry out the work for you. Once you receive your approval letter you can decide who you wish to award the job to. 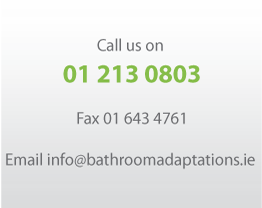 If you choose Bathroom Adaptations, just contact Caroline and we will book in the adaptation for the next available start date that suits you. A housing adaptation grant is available where changes need to be made to a home to make it suitable for a person with a physical, sensory or intellectual disability or mental health difficulty to live in. The grant can help you to make changes and adaptations to your home, for example, making it wheelchair-accessible, extending it to create more space, adding a ground-floor bathroom or toilet or a stair-lift. In some cases, the provision of heating can be included, but only under certain conditions. Contact your local authority for more details. If you only require minor work you can apply for the Mobility Aids Grant Scheme instead. However, you must satisfy the means test. If you don’t satisfy the income limits for the Mobility Aids Grant Scheme you should apply for the Housing Adaptation Grant for People with a Disability. Priority 1: A person who is terminally ill or fully/mainly dependent on family or carer; or where alterations/adaptations would facilitate discharge from hospital or alleviate the need for hospitalization in the future. Priority 2: A person who is mobile but needs assistance washing, toilet facilities, bedroom etc. ; or where without the alterations/adaptations the disabled person’s ability to function independently would be hindered. Priority 3: A person who is independent but requires special facilities to improve the quality of life, for example, separate bedroom or living space. When the local authority receives your application, it may ask for an occupational therapist’s (OT) assessment. The local authority can arrange for an OT assessment, but you can hire an OT privately to carry out an assessment and recoup up to €200 as part of the total grant, up to the maximum you are entitled to. The Housing Adaptation Grant for People with a Disability is a means-tested grant. This means your total household income is assessed to find out if you qualify for the grant and the amount payable. If you get a grant of more than €10,000 you must have a valid Tax Clearance Certificate. If you intend to pay more than €650 to a contractor, you must get your contractor to submit their C2/Tax Clearance Certificate to the local authority. The grant will not be paid if you start work before the grant is approved. However, it is expected that the work will start within 6 months of your grant approval. Priority will be given to people on medical grounds. If your household income is less than €30,000 you may qualify for 95% of the cost of the works (up to the maximum grant amount of €30,000). The proportion of the costs to be grant-aided will be tapered from 95% to 30% which will apply when household income is between €54,001 and €65,000. If you are unable to get a loan from a bank or building society to pay for the costs not covered by the grant, you may be able to get a local authority home improvement loan. If your house is less than 12 months old the grant will generally not exceed €14,500. If you are a local authority tenant, the local authority will meet the entire cost of the works. See website below should you need more information.